Guess what I got. Guess what I got! 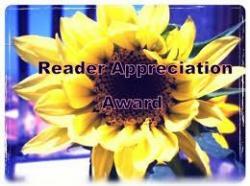 I got a Reader Appreciation Award. Loki-Lou from The Modfather gave it to me. It comes with the usual rules. I have to answer 10 questions that have been posed by the person who nominated me. I have to ask 10 questions of those I nominate. I shall follow these rules in order. 1. If you could live anywhere in world where would it be? And why? I honestly really don’t know. I have this image in my head of having my own apartment somewhere above a city. Sometimes it’s in L.A., sometimes it’s in NYC, sometimes it’s in Chicago, sometimes it’s in Dublin, and sometimes it’s in a small town in rural somewhere or other. I’ll have my own puppy and if I lose sleep I can get up at three in morning to bake or paint the bathroom or something. It really won’t ever happen because I don’t think I’d survive more than a week without my family, but still. .. sometimes I think about it. 2. What was your favourite TV show when you were a kid? We’ve always been a TV free home, but I did have a favorite Book Series. Hank the Cowdog. (He was funny ok!) And Amelia Bedelia. Oh I loved Amelia Bedelia. 3. Kindle or actual books? Kindles are Blasphemous. I refuse to partake of such things. Real books. All the way. 4. If you were picked up by the Tardis which Doctor would you like to travel the universe with? I’m sorry what? I know. I know. That’s another blasphemy, to have no understanding of Doctor Who. But I just cannot fit another obsession into my life right now…so *sigh* I have to be clueless on this one. 5. Gary Oldman or Alan Rickman? (If you like neither….unlikely I know but it might happen! Then – Benedict Cumberbatch or Tom Hiddleston). So Alan Rickman is Cl. Brandon from Sense and Sensibility. Tom Hiddleston is.. Well … besides a good many other things (*winks to Loki-Lou*) Loki … Benedict Cumberbatch is apparently Sherlock Holmes now? But who is Gary Oldman? How about Richard Armitage. 🙂 Yeah. Richard Armitage. Uh.. umm.. uh.. House, Tony Stark, and Sheldon Cooper. Then I’d find a topic they disagreed on and get them to argue. Following that I would sit down with popcorn and absorb. Laura Ingalls because I’ve always wanted to see what would happen if you brought someone form the olden days into today’s world. Mark Twain. After dinner we’d travel someplace and I’d observe him observing things to write about later and how he did so and well… I’d ask him to give me writing advice but in my mind it seems he’d be more inclined to arch an eyebrow at me, push me through the door and throw me out into the real world. “There. Live and put it in words.” But I’d like to know for sure. 7. In the event of a Zombie apocalypse would you sacrifice yourself to save a stranger or would you fight for your own survival? What? Oh man I’ve never thought of this. I think if such a thing as the zombie apocalypse did happen my mind and sense of reality would be so befuddled I’d be one of the first to go without having the chance to make this choice. 8. Do you prefer salted popcorn, sweet popcorn or half and half? What’s half and half? Never had that before. Probably should try it some time. Salty. No. Sweet. But sweet done right. But salty. Oh I don’t know! I like popcorn. 9. What is your favourite sport (and team)? 10. If the world was going to end and you only had time to tell one person that you loved them, who would it be? And why them. If you had to recommend one book regardless to whom, as in to the general public, your all time You-MUST-Read-This-Book would be…? One of the most annoying songs you’ve heard? Do you want to learn a new language? Which one? Why? Do you have a power outfit? As in, that outfit that makes you feel like you could absolutely conquer the world in? What is it? What’s the best part about blogging to you? Did you collect anything as a child? One of the best places to go in your town? Bonus Question! Will you come to my linky party tomorrow? This is for all of you! Tomorrow is TidBit Thursday again! Please come?! Hahaha! Thanks Masked Mom! Would you like to come too? It could be an event! And I have to admit … the glare really is a bother … who knows, maybe I'll be convinced someday. Yes! Yes you may! … I wonder if he would. ..? Hahaha, to be honest I'm not sure myself! You'll want your own space one day girlie! You can make sure you live close enough to your family so you see them often. I live right next door to my parents now. Aww…I love my kindle. You know when you get older the eyes start to go and reading on the phone is very hard. Plus no glare on the kindle when I'm under full sun on my beach blanket, toes in the sand. It's not kindle OR books, it's both! Congrats! And do give Chicago a whirl soon! Sounds like half and half would be right up your street Larissa! House, Tony Stark and Sheldon Cooper! Oh my! Please tell me I'd get an invite to that debate! I adore those three! And yep, Benedict Cumberbatch is indeed Sherlock (brilliant at it too), Alan Rickman is also many things (Snape and Dr. Alexander Dane are my faves! ), Tom Hiddleston…oh my word Tom Hiddleston…what was I saying?…oh yeah and Gary Oldman has been Sirius Black, Commissioner Gordon, George Smiley to name a few.